Henry Moore 1831 - 1895 Marine and landscape painter and watercolorist. Studied under his father William (1790-1851), also at the York School of Design and at the RA Schools. Elected Associate of the Royal Academy in 1885 and a full member in 1893, Royal Watercolour Society in 1880. 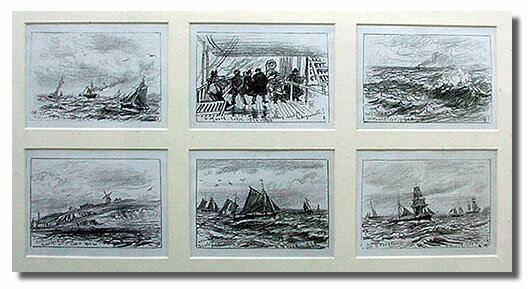 He was one of the first painters to to observe accurately the movement and moods of the sea. In his search for accuracy his technique became more fluid and more impressionistic, Moore was regarded as one of England's most important artists and his work was exhibited throughout Europe. Exhibited: 44@RA, 2@RBA, 13@ROI, 1@RSA, 60@RWS, 99@Leicester Gallery, 18@Glasgow Institute of Fine Arts, 20@Grosvenor Gallery, 102@Fine Art Society, 24@Royal Society of Artists Birmingham. Pencil Sketches by Henry Moore - A Day Trip to Boulonge 13th Sept. 1894.